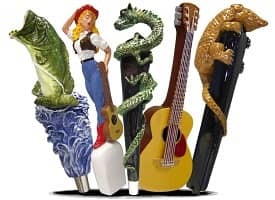 Custom Beer Tap Handles - Sculpture Concepts, Inc.
For over 30 years we’ve been successfully helping microbreweries bring their brands to life by designing and crafting custom beer tap handles. Having a custom beer tap handle for your beer/brand is an essential part of establishing an identity. It can make the difference between someone deciding to try your brew or not. An attractive, distinctive tap handle will stand out and be recognizable to tempt new customers and welcome back repeat customers familiar with your brand and beer styles. 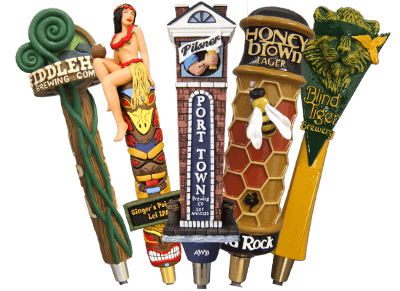 Here at Sculpture Concepts, we’ve been specializing in the artisanship of custom beer tap handles for three decades. We have successfully helped many breweries worldwide establish and maintain a positive image for their brands based on long term relationships. We look forward to making your brewery a part of our family! All of our products are made exclusively in the USA. From the design, prototype, molds, to manufacturing, all aspects and processes are done here in our Utah facility. Each tap is meticulously finished by our artists to make your product stand out. We take great pride in our contribution to the North American economy.